Dragon Age head writer David Gaider says fans need to relax, take a breath and stop worrying so much about the changes planned for Dragon Age 2. Dragon Age: Origins was a hit, so the news that BioWare is changing things up for the sequel was greeted with a certain suspicion, you might say. While the Origins hero was a mute Grey Warden who could be custom-built from the grond up, in Dragon Age 2 gamers will play a fully-voiced human named Hawke who lifts himself up from a lowly refugee to become the Champion of Kirkwall, with character choices limited to gender and class. The story will be focused on the development of Hawke over a ten-year span rather than on the grand battle to quell the Blight, and will apparently feature Mass Effect-style character interactions and simplified combat. It sounds like an awful lot is being changed, but Gaider has some advice for gamers getting themselves all wound up over it: don't. "I would suggest that you wait to hear exactly what our approach is before trying to figure out whether it's what you're interested in or not," he wrote in a message on the BioWare Social Network. "People appear to be acting as if the scant details we've revealed are all they'll ever learn about the game ever, and they're thus required to render judgment immediately." "You might, in fact, want to see exactly how we're implementing these features you dislike and seeing for yourself whether they differ from, say, Mass Effect's," he continued. "There are similarities, of course, but there are also differences... and to assume you know everything about how the game is going to feel based off the most cursory of information is just going to make you look foolish." He admitted that Dragon Age 2 won't be for everyone, but pointed out that it's still awfully early to be making that determination or even to be questioning why BioWare is doing what it's doing, since nobody really knows what BioWare is doing at all. "You should be able to judge prior to actually playing it - there will be information galore available prior to its release, I'm sure," he wrote. "But if you want to have questions asking the 'why' regarding our approach taken seriously, it might be sensible to wait and see what that approach is first." 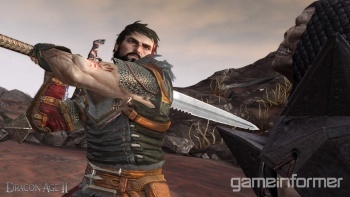 Dragon Age 2 is scheduled for release in March 2011 on the PC, PlayStation 3 and Xbox 360.